I am an colloid & interfaces scientist working within the Discipline of Chemistry which sits within the School of Environmental & Life Sciences. My laboratory is located at the multidisciplinary hub: The Newcastle Institute for Energy and Resources (NIER). I arrived at the University of Newcastle as a lecturer in Chemistry in December 1996 after a two year postdoc at the University of Otago in New Zealand. While employed at the University of Newcastle I have enjoyed the privilege of overseas sabbatical periods at the Universities of Sussex (UK), Bordeaux (France), Sheffield (UK), Durham (UK) and the Technical University of Berlin (Germany) together with a JSPS fellowship at the Osaka Institute of Technology (Japan). In 2013 I was promoted to Professor. I am an active researcher in both fundamental and applied colloid and surface chemistry. I have built an international reputation for my contributions to the nanometre-scale understanding of the solid-liquid interface in the presence of surfactant or polymer molecules. I was one of the first researchers to use soft-contact atomic force microscopy (AFM) to reveal detail of the lateral structure of adsorbed surfactant layers on the molecular scale. Through this I have developed highly specialised skills in soft-contact AFM imaging in water. By combining measurements of adsorption kinetics and adsorbed amounts, in 2003 we published the most thorough understanding of surfactant adsorption kinetics to date. In the last decade I have performed extensive fundamental research on the behaviour of stimulus responsive polymer molecules adsorbed to, or grafted from solid interfaces, and reported how these smart coatings behave in a variety of aqueous environments (project funded by the Australian Research Council (ARC)). In this project we have investigated pH-, salt- and thermo-responsive polymer coatings. Our current focus is on specific ion effects on polymer coating behaviour in aqueous solution. In a second major project I have conducted investigations into how polymeric colloids and mineral particles can stabilise fluid interfaces as underpin particle-stabilised foams (as occur in mineral flotation cells, personal care and food products) or emulsions (as occur in food, cosmetic and personal care products). This project was also funded by the ARC. My current ARC Discovery project is investigating a novel electrostatic route to liquid marble formation. Furthermore, I have applied my fundamental knowledge & skills to a variety of industrial research problems including projects concerned with mining emulsion explosives, water-based paints, powder coatings, plastic solar cells, mineral flotation, emulsions & foams. I teach in an average of five 10cp courses per year to all undergraduate years from level 1000 through to 3000 in the form of lectures, tutorials and laboratory sessions. These are predominantly in Physical, Colloid or Surface Chemistry. 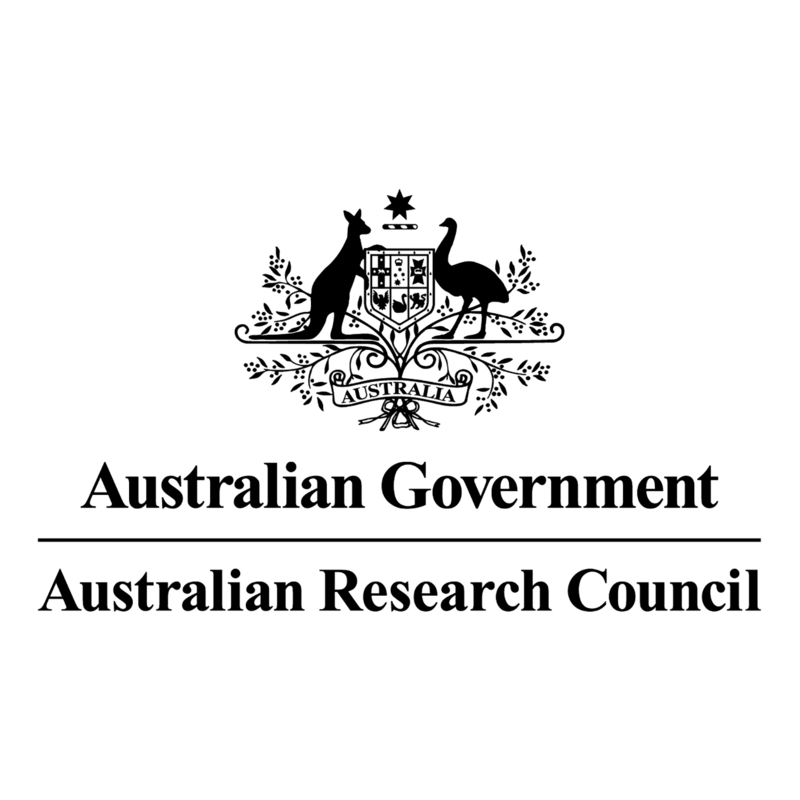 During the period 2017-2019 I am a member of the Australian Research Council College of Experts. In 2016 I was appointed to the Advisory Board of the Journal of Colloid and Interface Science. In 2015 I was appointed to the Editorial Board of the journal Advances in Colloid and Interface Science. In 2012 I served on the national ERA Research Evaluation Committee for Physical, Chemical and Earth Sciences. I was the Assistant Dean Research Training in the Faculty of Science & Information Technology 2009-2010. I have an outstanding track record of leadership and national service to the Australian Colloid and Surface Science community including membership of 5 conference organising committees since 2003 & national secretary from 1999-2009. I was Chair of the Royal Australian Chemical Institute Colloid and Surface Science Division from 2011-2012. I undertake a range of research assessment roles including reviewer for the top international journals in colloid and interface science, regular PhD thesis examiner and ARC grant assessor. 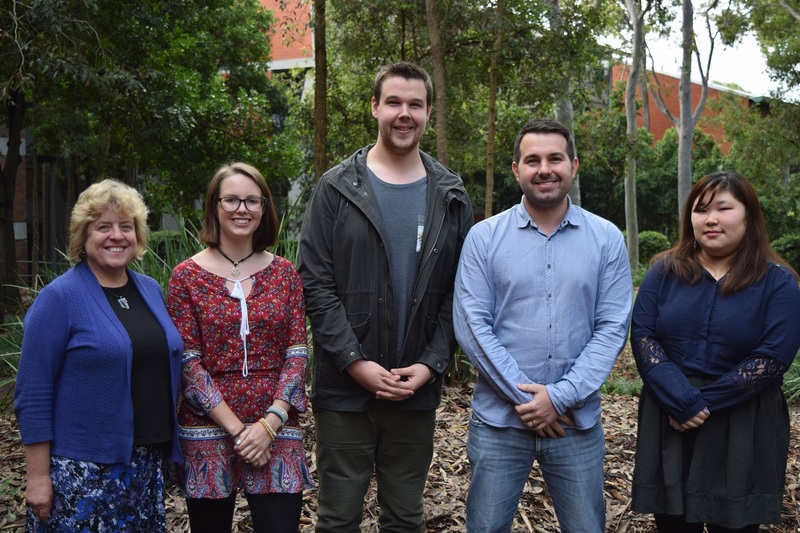 The nature of my research lends itself to collaboration, a mode of research that I particularly enjoy, whether it be with colleagues at this university, elsewhere in Australia, and indeed internationally. I have an excellent record of collaborative research coupled with successful research higher degree supervision. In the past decade I have collaborated with the following scientists: Prof. Steve Armes (University of Sheffield), Dr Steve Edmondson (University of Manchester), Prof. Syuji Fujii (Osaka Institute of Technology), A/Prof. Naoyuki Ishida (Okayama University), Prof. Shin-ichi Yusa (University of Hyogo) Prof. Regine von Klitzing (Technical University of Darmstadt), Prof. Bernard Binks (University of Hull), Dr Olivier Cayre (University of Leeds), Dr Seher Ata (University of New South Wales), Dr Stuart Prescott (University of New South Wales) and Dr Andrew Nelson (ANSTO). 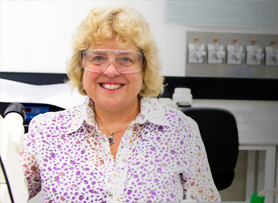 At this University I collaborate extensively with colleagues in Chemical Engineering: A/Prof. Grant Webber, Dr Peter Ireland, Laureate Prof. Graeme Jameson, Prof. Geoffrey Evans and Dr Roberto Moreno-Atanasio under the banner of the Priority Research Centre for Particle Processing and Transport, a multidisciplinary unit focussed on the science and engineering of handling wet and dry particles and powders. Organisation: Pacific Basin Chemical Societies Description: Thin films of pH-responsive polymeric microgels. Honolulu, USA December (2005). © 2016 American Chemical Society. Stability of bubbles laden with particles of different densities was investigated. 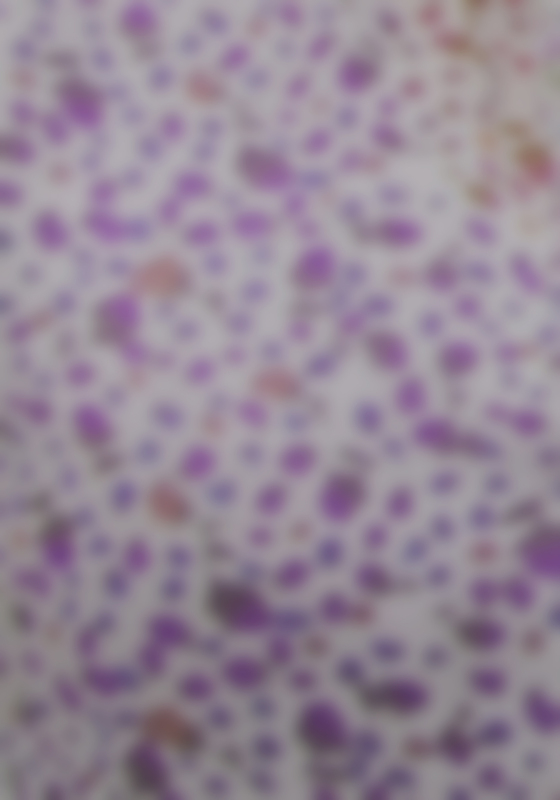 Capillary-held bubbles were produced and coated with particles across the density range of 1.2-3.6 g·cm-3. The materials used were poly(methyl methacrylate) (PMMA), glass, and anatase. The interaction of the bubbles, once brought into contact, was monitored using high-speed video recording. Visual inspection indicated that denser particles were more easily displaced during the contact of the bubbles and therefore the PMMA particles provided a particle barrier more resistant to coalescence. The coalescence events yielded information on the surface properties of the bubble and the detachment of particles. The attached particles commonly dampen the oscillation of the coalesced bubbles through viscous drag and change in the surface properties (e.g., area-exclusion principle). The dampening of the oscillation generally leads to a reduced mass of particles detaching from the bubble surface. It was found that the different materials investigated did not offer clear evidence of the effect of particle detachment on the bubble surface properties in the present systems. On the other hand, the detachment of different particle materials seemed to be consistent with one another when comparing the attachment and detachment forces exerted on the particles based on their density, size, and hydrophobicity. It was concluded that particles of lower density are more effective in stabilizing interfaces, and thus particle density is an important parameter in the selection of materials for the handling of dispersions. © 2016 The Royal Society of Chemistry.The interactions of two oil droplets grown in the presence of swollen, lightly cross-linked cationic poly(tert-butylamino)ethyl methacrylate (PTBAEMA) microgels was monitored using a high-speed video camera. Three oils (n-dodecane, isopropyl myristate and sunflower oil) were investigated, each in the absence and presence of an oil-soluble cross-linker [tolylene 2,4-diisocyanate-terminated poly(propylene glycol), PPG-TDI]. Adsorption of the swollen microgel particles was confirmed by interfacial tension, interfacial elasticity and dilational viscosity measurements on single pendant oil droplets, and assessment of the oscillatory dynamics for coalescing droplet pairs. Like the analogous bulk emulsions, particle adsorption alone did not prevent coalescence of pairs of giant Pickering emulsion droplets. However, prior addition of surface-active PPG-TDI cross-linker to the oil phase results in the formation of highly stable microgel colloidosomes via reaction with the secondary amine groups on the PTBAEMA chains. Colloidosome stability depended on the age of the oil-water interface. This reflects a balance between the adsorption kinetics of the PPG-TDI cross-linker and the microgel particles, each of which must be present at the interface to form a stable colloidosome. Colloidosome formation was virtually instantaneous in n-dodecane, but took up to 120 s in the case of isopropyl myristate. The impact of an acid-induced latex-to-microgel transition on the interaction of giant colloidosomes (originally prepared at pH 10 using isopropyl myristate) was also studied. This acid challenge did not result in coalescence, which is consistent with a closely-related study (A. J. Morse et al., Langmuir, 2014, 30(42), 12509-12519). No evidence was observed for inter-colloidosome cross-linking, which was attributed to retention of an aqueous film between the adjacent pair of colloidosomes. © 2016 American Chemical Society. The conformation of a hydrophobic, weak cationic poly(2-diisopropylamino)ethyl methacrylate (PDPA) brush was studied using neutron reflectometry as a function of aqueous solution pH, ionic strength, and anion identity. In pH 4, 10 mM potassium nitrate the brush is highly charged, resulting in an extended, dilute conformation; at pH 9 the uncharged brush collapses to a single, dense layer. The brush response to added salt at constant pH (4.5) for varying concentrations of the potassium salts of acetate, nitrate, and thiocyanate revealed ion-specific conformations of the brush. At low ionic strength (0.1 mM) the brush was collapsed, independent of salt identity, while at higher ionic strengths (up to 500 mM) the conformation was dependent on counterion identity. The brush exhibited extended conformations in the presence of kosmotropic acetate counterions, while collapsed conformations were retained in the presence of strongly chaotropic thiocyanate counterions. The brush showed a richer set of behaviors in the solutions containing the weakly chaotropic nitrate anion, being similar to acetate (swollen) at intermediate concentrations but similar to thiocyanate (collapsed) at high salt concentrations. Numerical self-consistent field (nSCF) simulations indicate that the response of the brush to pH changes is dominated by the hydrophobicity of the polymer at pH values near the pKa. Furthermore, the simulations reveal that the addition of a single Flory-Huggins interaction parameter analogous to the hydrophilicity of the counterion is sufficient to replicate the observed specific anion response of a hydrophobic weak polyelectrolyte brush. © 2016 American Chemical Society. The effect of anion identity and temperature on the internal nanostructure of poly(N-isopropylacrylamide) brushes were investigated using neutron reflectometry (NR), atomic force microscopy (AFM), and quartz crystal microbalance with dissipation monitoring (QCM-D). NR and QCM-D measurements showed that addition of strongly kosmotropic acetate anions shifted the lower critical solution temperature (LCST) to lower temperatures relative to pure D2O/H2O, while strongly chaotropic thiocyanate anions shifted the LCST to higher temperatures. Polymer density profiles derived from NR showed direct evidence of vertical phase separation at temperatures around the LCST in all conditions. Results indicate that the density profiles were not simple modulations of structures observed in D2O to higher or lower temperatures, with both anion identity and ionic strength found to influence the qualitative features of the profiles. In particular, the presence of thiocyanate broadened the LCST transition which is attributed to the ability of the thiocyanate anion to electrosterically stabilize the brush above its LCST. Complementary AFM data showed that the acetate ion induced collapsed structures while a broader transition is observed in the presence of thiocyanate. © 2016 American Chemical Society. Complementary interaction force measurements between an atomic force microscope (AFM) tip or colloid probe and a weak polybasic brush have been shown to yield a number of fundamental characteristics of the brush and its response to the presence of specific anions in aqueous solution. Stretching of the poly(2-diisopropylamino)ethyl methacrylate (PDPA) chains physisorbed to the AFM tip and modeling the resultant force curves allowed the persistence and contour lengths, molecular weight, and thus grafting density of the brush to be determined. In kosmotropic acetate, high osmotic forces associated with the swollen PDPA brush repelled the colloid probe during both approach and retraction. For mildly chaotropic nitrate the behavior was similar, but at high ionic strength and during retraction, the interaction was strongly adhesive partly because of decreased brush solvation. For strongly chaotropic thiocyanate, the interaction was adhesive over the entire concentration range studied. Here, physical contact between the poorly solvated brush and the colloid resulted in an attractive force. © 2015 Elsevier Ltd. The stability of capillary-pinned bubble pairs covered with hydrophobized particles in aqueous solutions of 1-pentanol or methyl isobutyl carbinol (MIBC) was studied using high-speed cinematography. Glass particles were first rendered hydrophobic by covalently bonding a linear alcohol onto the solid interface to achieve a specific hydrophobicity (i.e. contact angle of 43° measured with the captive bubble on a treated wafer) and effectively avoid the presence of any mobile hydrophobizing surfactant. The resistance to coalescence of the bubbles was measured at different frother concentrations and for various initial bubble interfacial areas covered by particles; with particle coverage not exceeding the contact region between the bubbles.Frother molecules were shown to delay the coalescence of bubbles whereas particles were not present in a sufficient quantity at the interface of the bubbles to provide steric stability. However, in some cases in the presence of MIBC, the particles were believed to act as means of transportation for the frother molecules to the surface of the bubbles thus forcing the local relaxation of the interface, which improved bubble stability. The coalescence of two bubbles released energy causing a rapid motion of the interface. This motion was sufficient to expel a fraction of the attached particles from the interface. The addition of frother, and of particles in some cases, increased the dampening of the oscillatory motion generated by bubble coalescence. In general, damped bubble oscillations were associated with a reduced quantity of particles detaching from the bubble. Although particles were observed to dampen the oscillation of the bubble, they were not as effective as the frother molecules in reducing the detachment of particles upon bubble coalescence. This finding is believed be of relevance for industrial applications such as froth flotation. © The Royal Society of Chemistry 2015. The interactions between two individual water droplets were investigated in air using a combination of coalescence rig and high speed video camera. This combination allows the visualization of droplet coalescence dynamics with millisecond resolution which provides information on droplet stability. Bare water droplets coalesced rapidly upon contact, while droplet stability was achieved by coating the droplets with polystyrene particles carrying pH-responsive poly[2-(diethylamino)ethyl methacrylate] hairs (PDEA-PS particles) to form liquid marbles. The asymmetric interaction of a water droplet (pH 3 or 10) armoured with the PDEA-PS particles (liquid marble) with a bare droplet at pH 3 exhibited intermediate stability with coalescence observed following an induction time. The induction time was longer for the pH 10 liquid marble, where the PDEA-PS particles have a hydrophobic surface, than in the case of a pH 3 liquid marble, where the PDEA-PS particles have a hydrophilic surface. Furthermore, film formation of PDEA-PS particles on the liquid marble surface with toluene vapour confirmed capsule formation which prevented coalescence with the neighbouring water droplet instead wetting the capsule upon contact within 3 milliseconds. This study illuminates the stability of individual particle-stabilized droplets and has potential impact on processes and formulations which involve their interaction. Particle-stabilised foams (or froths) form the fundamental framework of industrial processes like froth flotation. This review provides an overview of the effects of particles on bubble surfaces. The characteristics of the particles have a profound effect on the stability of the bubbles although the stabilisation mechanisms may differ. It is well known that layers of particles may provide a steric barrier between two interfaces, which prevents the coalescence of bubbles. Although perhaps considered of lesser importance, it is interesting to note that particles may affect the bubble surface and momentarily suppress coalescence despite being absent from the film separating two bubbles.Foams are at best metastable and coalescence occurs to achieve a state of minimum energy. Despite this, particles have been reported to stabilise bubbles for significant periods of time. Bubble coalescence is accompanied by a release of energy triggered by the sudden change in surface area. This produces a distinctive oscillation of the bubble surface, which may be influenced by the presence of incompressible particles yielding unique surface properties. A survey of the literature shows that the properties of these composite materials are greatly affected by the physicochemical characteristics of the particles such as hydrophobicity and size.The intense energy released during the coalescence of bubbles may be sufficient to expel particles from the bubble surface. It is noted that the detachment of particles may preferentially occur from specific locations on the bubble surface. Examination of the research accounts again reveals that the properties of the particles may affect their detachment upon the oscillation of the bubble surface. However, it is believed that most parameters affecting the detachment of particles are in fact modifying the dynamics of the three-phase line of contact. Both the oscillation of a coalescing bubble and the resulting detachment of particles are highly dynamic processes. They would greatly benefit from computer simulation studies. Millimeter- and centimeter-sized "liquid marbles" were readily prepared by rolling water droplets on a powder bed of dried submicrometer-sized polystyrene latex particles carrying poly[2-(diethylamino)ethyl methacrylate] hairs (PDEA-PS). Scanning electron microscopy studies indicated that flocs of the PDEA-PS particles were adsorbed at the surface of these water droplets, leading to stable spherical liquid marbles. The liquid marbles were deformed as a result of water evaporation to adopt a deflated spherical geometry, and the rate of water evaporation decreased with increasing atmospheric relative humidity. Conversely, liquid marbles formed using saturated aqueous LiCl solution led to atmospheric water absorption by the liquid marbles and a consequent mass increase. The liquid marbles can be transformed into polymeric capsules containing water by exposure to solvent vapor: the PDEA-PS particles were plasticized with the solvent vapor to form a polymer film at the air-water interface of the liquid marbles. The polymeric capsules with aqueous volumes of 250 ÎL or less kept their oblate ellipsoid/near spherical shape even after complete water evaporation, which confirmed that a rigid polymeric capsule was successfully formed. Both the rate of water evaporation from the pure water liquid marbles and the rate of water adsorption into the aqueous LiCl liquid marbles were reduced with an increase of solvent vapor treatment time. This suggests that the number and size of pores within the polymer particles/flocs on the liquid marble surface decreased due to film formation during exposure to organic solvent vapor. In addition, organic-inorganic composite capsules and colloidal crystal capsules were fabricated from liquid marbles containing aqueous SiO2 dispersions. © 2014 American Chemical Society. 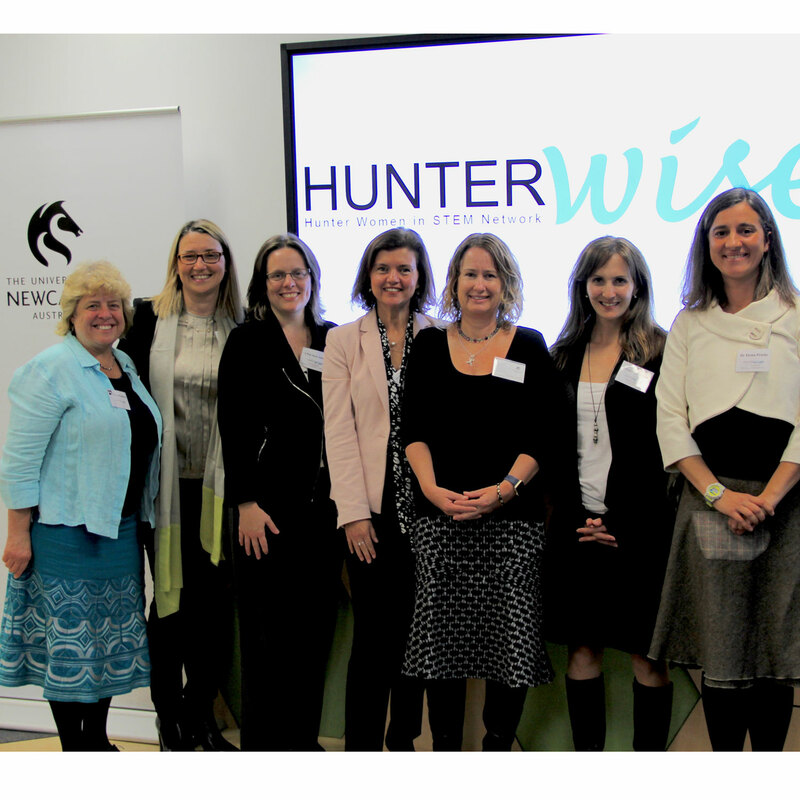 Hunter Women in STEM and Entrepreneurship (HunterWiSE), a new STEM outreach program based on mentorship, was launched on Monday the 31st of July. 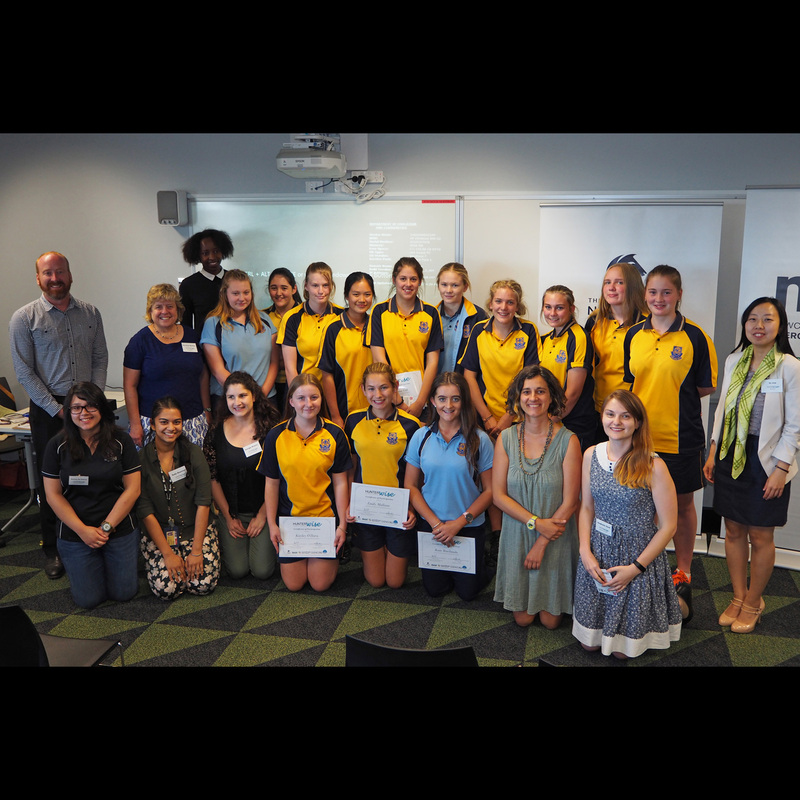 UON's Professor Erica Wanless features in the report of a groundbreaking conference.